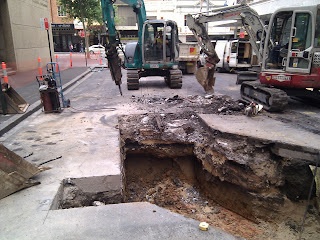 Energy Australia are doing some work in Barlow St. Sydney. Their contractors(?) have uncovered some old Tram tracks. I managed to get a photo of one the rails and a partly visible sleeper. I asked the friendly contractors for a small piece of rail - worth a try I think.